But it was awesome! Got my case packed (at least 3 times. I think everything is accounted for now), and bought a few last things in my favourite shops. Then I went off to LinuxCon Tokyo, and heard Linus Torvalds speak. If you don’t know, he’s a geek rock star, who has changed the face of computing thanks to his work. I was impressed! Then had really delicious eel for tea in a traditional restaurant which has a Michelin star. And then finished the day with Karaoke, where I sing until I could sing no more. Well, sung until I couldn’t sing well anymore. Curse those high notes! But was is not immediately obvious in that picture are the monkeys! 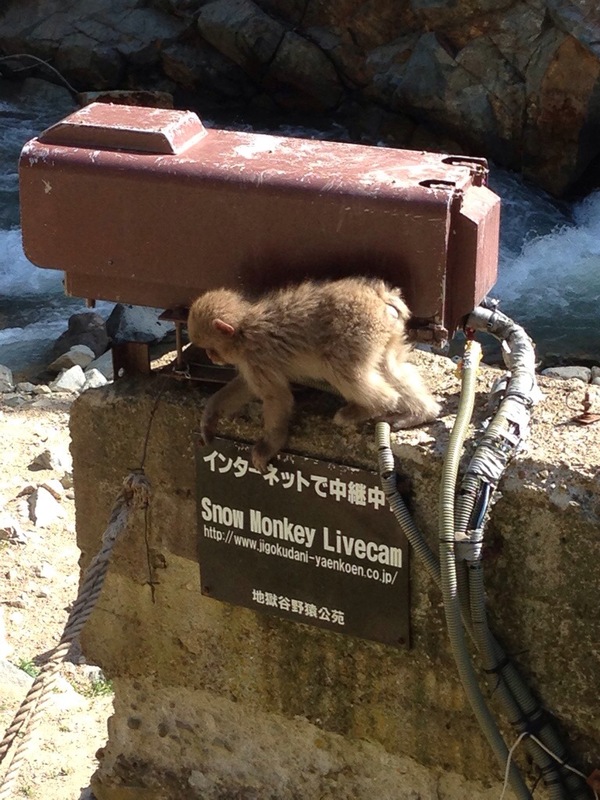 The monkeys live in the mountains, but used to come down to bathe in the hot springs in the winter. This was a problem for the people using the hot springs, so they built a bath for the monkeys to use themselves. So unlike a zoo, these are wild monkeys who choose to be here, and there are no bars or fences. 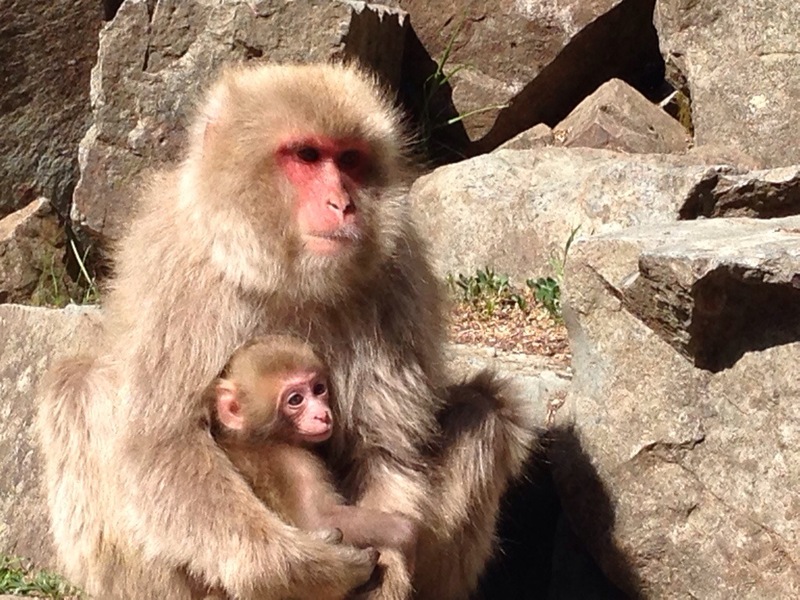 They are Snow Monkeys, or Japanese Macaques and they look gorgeously soft and fleecy! And there lots of mothers with little young monkeys! Needless to say we spent ages going “Awww” and took hundreds of pictures. Tokyo is a great place to shop, from the electronics shops of Akihabara to the fantastic stationery shops all over the city. But today we went to a flea market, and I made an unexpectedly brilliant purchase. 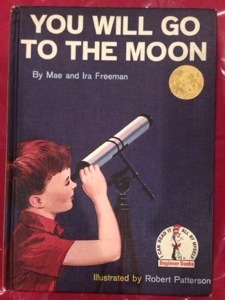 It’s from 1959, well prior to the actual moon landings obviously, and written in very simple language for young children. I think it’s cool! I’ll post more when I can get decent pics of the inside pages. 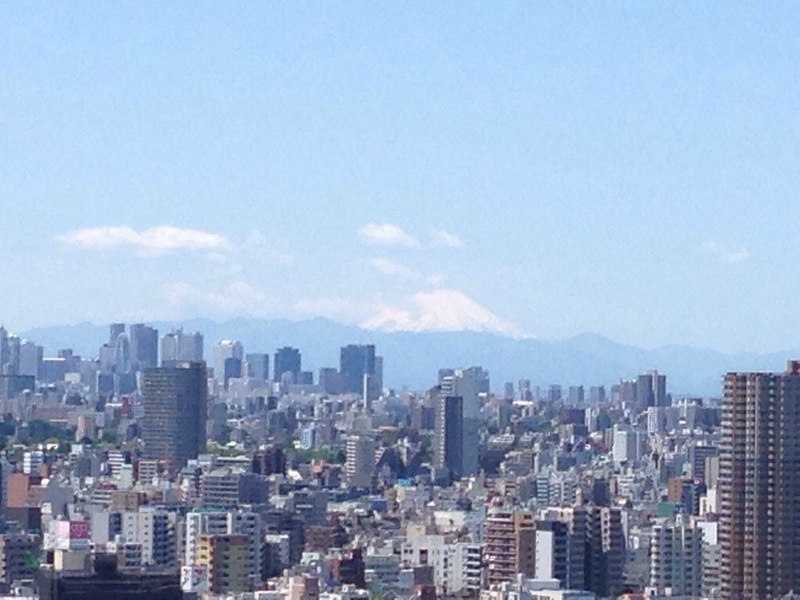 Mount Fuji often likes to hide in the clouds, or just in the haze, as it’s pretty far away. So it was cool to see it clearly this morning from the balcony. Today, I went to the big Tokyu Hands shop in Shibuya. It is, I suspect, the best shop in the world. I spent ages in it. I spent ages in just the vast stationery section! It would seem to be about 24 floors in size, since it starts at the basement and goes up to 7 and there’s an A, B, and C sub-level to each floor. Anyway, let’s not focus on that – it’s big. And it goes from chemistry equipment on the top floor, to bikes on the bottom floor with a lot of cool things in between. I highly recommend it! Day four was a Sunday. 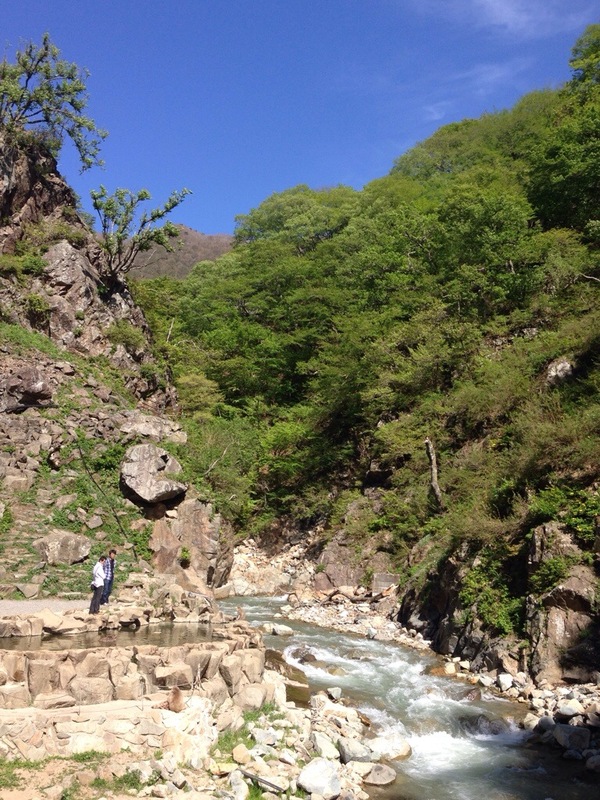 I walked a long way on Saturday, so I took a day off walking. Fortunately, entertainment came to me, as we had guests for dinner. They included a very cute 2 year old, so I had my usual Sunday afternoon activity of winding up a wee kid. I had a lot of fun 🙂 Like all kids, he was endlessly amused by simple things like the curtains being blown open by the wind repeatedly. Like all kids that age, his parents had to clarify what he was saying, but in his case it was because he said some things in Japanese which I stood no chance of understanding! I also ate way too much of Karen’s delicious home-baked cakes, fresh crusty bread, chips and dips. Not in that order. Oh well. I am on holiday! The good news is that I haven’t had to wear a face mask since the first day. It was noted that Japanese people don’t have noses like mine, so apparently it didn’t suit me well! Didn’t do a lot on Thursday – went for a walk in the morning, got a bit tired in the afternoon with jet lag and sat around, then had great meal in Akihabara in the evening. But that’s okay – that’s jet lag and sniffles for you. We had Chinese for tea, and I loved the Japanese interpretation of sweet and sour chicken – Karen tells me they use a dark vinegar which is more like balsamic, which makes a wonderful dark sauce that looks nothing like the bright orange sauce we get at home. Quiet night in with a DVD, and fortunately my legs still work! 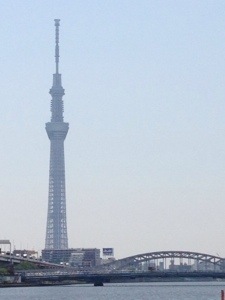 After my adventures in Tokyo last time, some people are surprised that I wanted to come back again. But I always planned to come back – it’s still a cool place, and I still have friends here. The biggest problem with Japan remains the fact that it’s an awfully long way away. My nose has been playing up a bit at home, but 12 hours on a Virgin Atlantic plane gave it a complete meltdown. Worse still is the cultural sensitivity about blowing one’s nose in Japan, which made me even more paranoid about having to wipe it every 30 seconds. 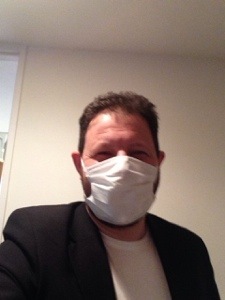 So once I arrived at my friend’s house, I did the appropriately Japanese thing and got myself a face mask. That way I keep my big red hooter to myself, and drips are contained. Sorry that’s so disgusting, but that’s how it works! I also realised yesterday that I have been doing pretty well at going to the cinema, as I had seen most of the big movies available on the plane. All the ones that interested me anyway. So I watched some TV instead. Watched the pilot episode of True Detective, which people in work have been raving about, and I can see it has the potential to be interesting. But most of all I enjoyed 20 Feet From Stardom, a documentary about backing singers, the unsung heroes of the music industry, who contribute so much but remain virtually unrecognised. It was very interesting, and quite thought-provoking as they struggle with the choices of being very successful in the background, or aiming for the limelight and failing. Oh yes, I watched Frozen too. That’s a very odd movie! But I fell asleep and missed the end of it. You are currently browsing the Destroy All Onions! blog archives for May, 2014.